Sharks are vital to the health of the oceans. Sharks are keystone species in the oceans. 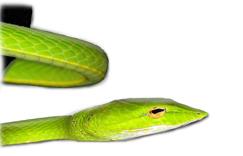 They are the tigers of the sea and they play critical roles as both predators and scavengers. For over 400 million years, they have helped maintain healthy and balanced marine ecosystems by eliminating diseased and genetically defective animals. Removing sharks will result in the collapse of the entire marine food web. It’s like a big tower of jenga; you take out a key brick at the bottom and the whole thing collapses. This is because of a phenomenon called ‘Trophic Cascade’. Overfishing of sharks cascades into a sudden uprising of the species they prey on, causing an abundance of skates, rays and smaller sharks, which then steadily devastate populations of animals further down the food chain, like shellfish..
Our commercial fisheries are doomed. By killing sharks, we unknowingly inflict collateral damage on commercial food fisheries—fisheries that support large human populations around the world. In Tasmania , for instance, the demise of sharks led to the collapse of the spiny lobster industry. In Chesapeake Bay in the United States , excessive shark hunting led to a fall in the population of scallops and clams. And clam chowder went off the menu in eateries across the East Coast of the USA . Sharks are under severe threat. According to the latest estimates, over a 100 million sharks are killed each year for their fins. Shark populations are now reduced by 70% in some species and up to 98% in species like tiger sharks, hammerhead sharks, bull sharks and blacktip sharks. Sharks are also slow to recover from over-hunting because they are slow breeding and slow-maturing apex predators. The greatest threat is from shark fin soup. The majority of the demand for shark meat is from the shark-fin industry, centered in Asia . Singapore is one of the main consumer countries, along with Mainland China, Hong Kong, Taiwan, Malaysia and Thailand. For every Chinese wedding banquet in Singapore that serves shark fin soup, the world loses another 40-50 sharks. For the sake of our oceans, give up the soup. Every time you say no to shark fin soup, you not only save the life of a shark, you help save thousands of marine life. As more of us give up shark fin soup altogether, and encourage still more people to do the same, we will eventually restore shark populations to healthy levels and our oceans to their natural equilibrium. It’s a worthwhile goal. Say ‘no’ to shark fin soup. 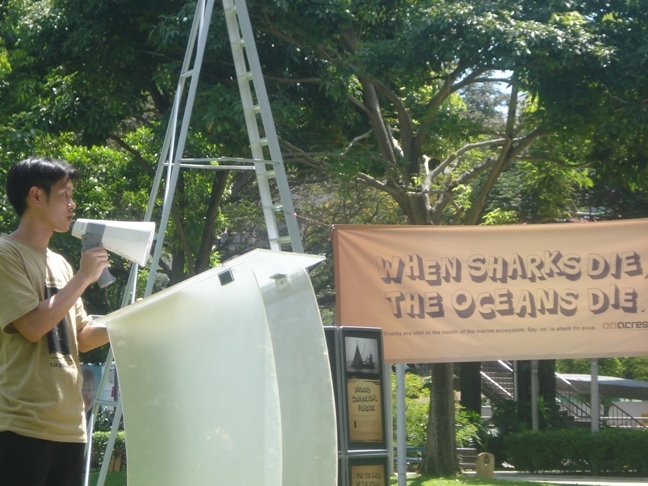 In 2009, ACRES held two groundbreaking events in Singapore to raise awareness on the plight of sharks and the devastating effects of the shark fin trade, as well as having an ongoing awareness initiative “A Wedding Cake With a Strong Message.” These drew public and media attention to the serious threats posed to not only sharks, but also the oceans and mankind, by the continued slaughter of sharks for their fins. 18th April 2009 was a momentous day for ACRES and the animal protection movement in Singapore when we held the first ever gathering of animal lovers at Speakers Corner! 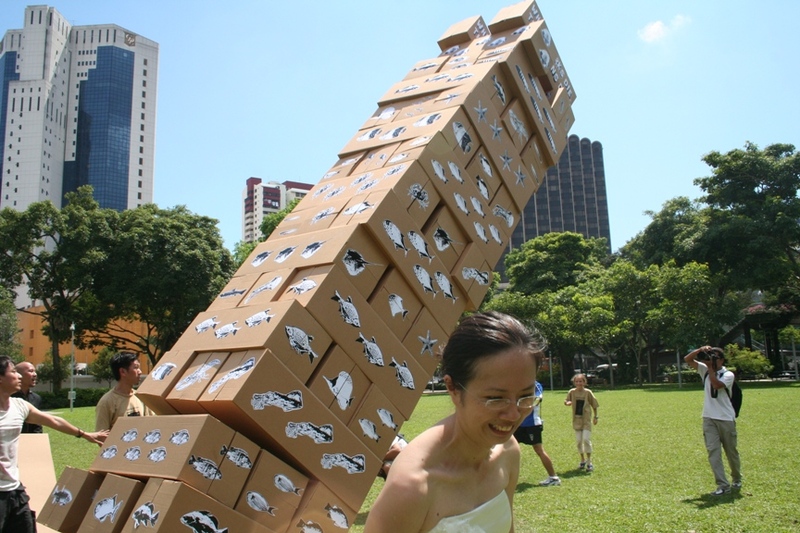 On a blisteringly hot day, animal lovers in Singapore gathered together to learn more about the devastating effects of shark fin consumption on marine ecosystems through the “Ocean Jenga”. After a rousing speech by Louis Ng, Executive Director of ACRES, we watched as a bride and groom removed the sharks from a marine food chain, illustrated by giant cardboard jenga blocks, and brought the whole ecosystem crashing down- symbolising the devastating effect that serving shark fin soup at weddings is having on the oceans. Afterwards, people of all ages wrote their pledges to not eat or serve shark fin on a large shark-shaped pledge board. News of the event reached out all over the world, from Malaysia to Australia to China and even to South Africa, raising much-needed awareness on the disastrous ecological consequences of the continuing shark fin trade. This event, conceptualised by BBDO Singapore, launched ACRES’ campaign against sharks fin soup. Held at The Atrium @ Orchard from the 2nd-4th October 2009, this first-of-its-kind 3-day event coincided with World Animal Day and featured members of the public breaking shark fin soup bowls, symbolically breaking the habit of eating sharks fin and sending a message to the world that sharks are more valuable than soup. The broken pieces were used on the spot to create a work of art — a gigantic 15m-long mosaic of a shark along Orchard Road. Among the first to break their bowls were celebrity supporters Jamie Yeo and Melody Chen, and a surprise visitor was none other than Singapore’s very own Phua Chu Kang, who joined in the fun and smashed his bowl! Samples of an equally costly, cruelty-free, vegan alternative to shark fin soup were distributed during the event, courtesy of Fairmont Hotels & Resorts – the only hotel in Singapore who has made a conscious choice to stop serving shark fin soup. Members of the public wrote their pledges to say no to sharks fin on a giant pledge wall. Since the event, various artists have been busy transforming the broken pieces into permanent works of art that will be displayed in exhibitions and featured in ACRES’ education programmes. Every single bowl will have a second life, as something beautiful and educational instead of something cruel. 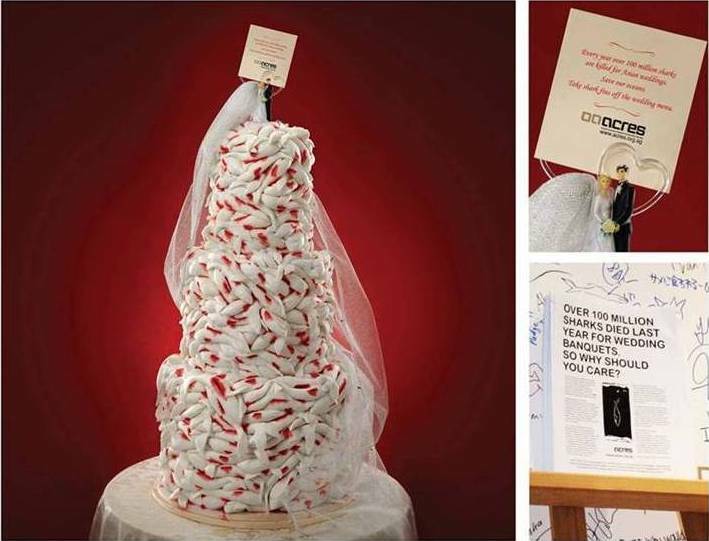 ACRES wanted a low-cost way to educate brides, grooms, in-laws and wedding planners on the consequences of their serving sharks fin at their weddings, and we engaged BBDO Singapore to help us spread this important message. Since we were targeting brides, grooms and wedding planners, their idea was to bake a wedding cake with a strong message. The giant multi-layered cake was made up of dead shark figures, carved painstakingly out of fondant. Each shark had its fins chopped off. The cake was placed in well-known bridal studios and bridal registries. A card and an accompanying leaflet explained the problem and called for action to end the slaughter. The cake was a crowd stopper. Hundreds of people pledged to give up the soup. The media coverage helped spread awareness to thousands more. The cake travelled across Singapore for over two weeks, until it became completely inedible. But the impact it created ensured that the message travelled much further. 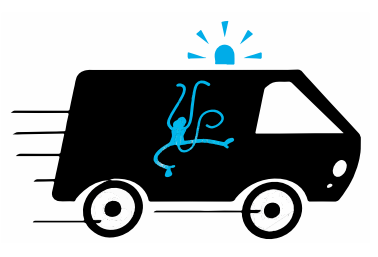 Our deepest thanks to BBDO Singapore for conceptualising and executing this highly effective public awareness campaign. 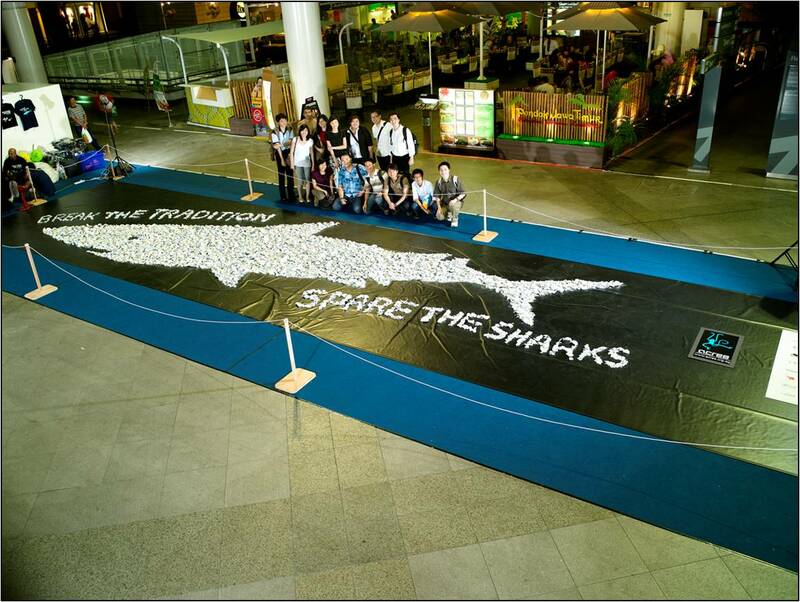 ACRES continues to raise awareness about sharks and the shark fin industry through our talks and roadshow display, which has travelled to schools and public venues all over Singapore, reaching out to thousands of people. A vegetarian, earth-friendly alternative to shark fin soup. Cut the carrots into chunks. Boil together with the yellow beans to make the soup stock. Strain the stock when soup base is ready. Put the stock aside. Cut the squash into quarters and boil in water with skin. Once softened, take up the squash and leave it to cool in a ice filled pot. After cooling, you can easily peel the strands of squash away from the skin. Be careful not to tear the strands apart. Keep the strands together so that you get the ‘shark fin’ in a whole piece when served. Heat oil in pan. Stir in the stripped carrots and mushrooms till fragrant. Add in the rest of the ingredients to stir, except for the egg whites. Once it’s fragrant, add in prepared stock to ingredients. Add seasoning to taste and black soy sauce for colour. Bring to boil, stir in sweet potato starch. Stop when you get the consistency you prefer. Then last but not least, add the beancurd skin into the soup. Now gently place the pieces of ‘shark fin’ into the soup. Let it simmer for 10mins on low heat. Finally, serve with a sprig of coriander and a dash of vinegar.